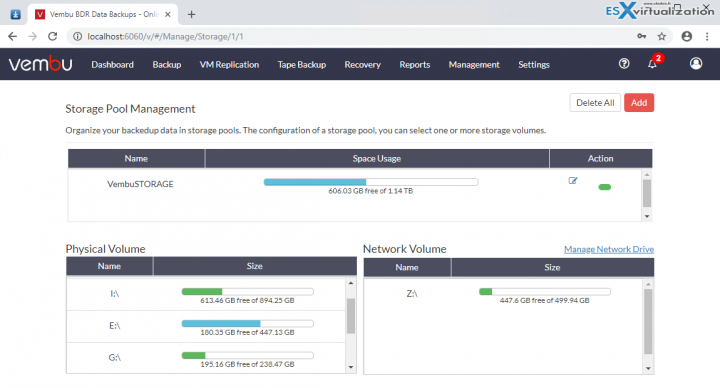 Vembu Backup and Disaster Recovery Suite (BDR Suite) 4.0 has been released a few months ago and this review will try to give you an idea what to expect when you try and install this product in your environment. First of all, this is a sponsored review, but it does not mean that I will not say what I have to say if there is something which disturbs me or something which simply does not work as expected. For those of you who do not know Vembu yet, it's been several years now that the company based in Chennai is going after the enterprise market. Before, Vembu was already in the service provider market for several years and has had good success. 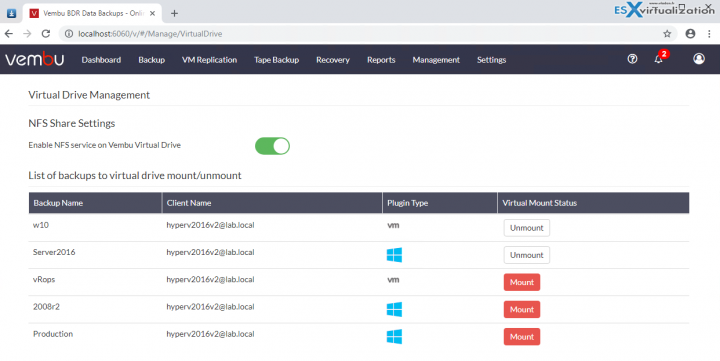 Vembu BDR Suite provides agentless image level backup for the virtual machines running on VMware and Hyper-V. For windows server & workstation, you can configure image, file or application level backup. For Linux and MAC machines, you can configure file and application level backups. Vembu also allows you to perform Bare Metal Recovery. From Laptops, desktops to Servers or Virtual machines running under VMware or Microsoft, Vembu BDR suite can protect the whole environment from a single console. This was quite a dream just a couple of years ago, but now, it's a commodity for some, but not for others. Vembu is part of those software vendors who add features and functions on regular basis. The latest version of Vembu 4 allows you to backup running VMs inside a Hyper-V cluster even if the VM is moved to another host due to a failure of the source host. This is a new and quite important feature to be added. 8 Gigs of RAM (16 Gb recommended) for the machine which hosts Vembu BDR suite. Best practices for data protection says to keep data in at least two different locations and on different media. It is part of the risk management so putting “all eggs in the same basket” isn't really the right thing to do. For this Vembu has different backup options, including native support of tape. You can also replicate a copy of backup from on-premises server to a remote or offsite location using Vembu OffsiteDR. The remote site holds those backups for a case where a primary backup location is not available or has a hardware problem. You can make a backup copy to OffsiteDR server via LAN/WAN based on OffsiteDR location. You can also have Vembu installed in the cloud if you don't want to spend too much money on hardware. If you looking for Hybrid cloud deployment, you can opt for Vembu CloudDR. You have one copy of backup data in the on-premise server and the second copy of backup data at Vembu Cloud which is in AWS. Vembu BDR suite can also replicate production VMs to a remote site where you have another ESXi host running which holds the replica VM waiting to be powered ON. While it is a convenient scenario which allows you to bring online your production VMs fast in case the mains site has problems, there might be additional licensing costs from VMware for that particular ESXi host which needs to be covered by a license. My Windows installation was a very easy task as the installer is just asking where to install the product. Screenshot from the installation showing the default configuration details and access ports. Note that you can customize where to install and which ports you want to use in case the ports by default are already taken. Vembu can protect Hyper-V, VMware and physical workloads (with agents). Let's have a look at VM backup for Hyper-V. As you can see, you can add either Hyper-V standalone hosts or a Hyper-V cluster. In my lab, I only run a single Hyper-V host so I've added a single host. Note the Add SMB Server menu allowing you to add a Windows server (physical) to be backed up. After clicking the Backup Button, you can add VMs to a backup job. There is a possibility to exclude disks if you need to. You need to select the VM(s) which will be part of the backup job and click the Next button to continue to the next page of the backup job creation process. On the next page, you'll have Guest processing options in case you're running some applications which need to be quiesced. Those options will allow you to specify guest os credentials. Vembu has this Application-Aware feature available for Hyper-V environments as well as for VMware environments. It is necessary for Microsoft Exchange Server, SQL Server, Active Directory, SharePoint are some of the database sensitive applications that require prior steps to be taken before configuring a backup, for database consistency. Scheduling options provide you to select a frequency for the incremental backups (as low as every 15 min) or which can also be executed daily or weekly. You can also configure additional full backups outside the main backup schedule. Note that you have a possibility to configure advanced retention (Grandfather-Father-Son) where daily merge, weekly merge, and monthly merge can be configured. The Advanced retention policy is designed to keep incremental data for a longer period of time. Every incremental backup will be periodically merged on daily, weekly and monthly basis representing son, father, and grandfather. This Grandfather-Father-Son method is letting the users maintain consistent restore points at periodic intervals. On the same page, you have a possibility to choose storage pool from the list. In my case, I do have only a single storage pool. You can also configure and enable encryption. You can now encrypt your backups on a per-job basis. After defining a password, you’ll be able to select this password during a new job creation wizard or create also a new password for a specific job. Full and the incremental data of backups will be encrypted with AES-256 bit encryption algorithm. During a restore operation, you’ll be prompted to enter the encryption password. Vembu BDR suite allows the recovery of Full VMs, Individual virtual disks, individual files present either on the virtual or physical disk (if you're backing up physical system). You can also recover a physical machine which has a hardware failure, as a virtual machine. In every company, there are still some physical servers running Windows. I remember that not long time ago, a physical domain controller or physical SQL server was quite present in the enterprises. You can protect those physical servers with Vembu BDR. The image level backup allows you to recover the image as a VM which you can start directly on the backup server. You just need to activate the hyper-v role on that backup server. You have 5 different choices when it comes to recovery. If you're restoring a VM which has been, for example, corrupted with malware, or isn't booting, the restore operation will simply do Quick VM Recovery and recovers the backups as ready-state VMs which will be automatically powered on. The restore options allow you to pick any of the two hypervisors (VMware or Hyper-V). Like this, Vembu can also be used to migrate to and from VMware or Hyper-V.
Once clicking the Next button, you just have a review page where you can verify that the recovery option is what you really want to do. Vembu Storage pool is basically a storage repository where Vembu stores your backups. Vembu BDR server has a hybrid volume manager allowing you to add individual volumes which together creates a storage pool. You can add volumes as you like and you can also have more than one storage pool. You can add different storage media such as direct attached storage (DAS), NAS(NFS and CIFS) and SAN(iSCSI and FC) to the same backup server any time as your storage repository needs to be scaled up. Users can also aggregate the space available from different volumes and utilize them to store backups. To configure the storage pool just click Management > Storage Pool. Vembu’s file system called Vembu HIVE, and this system exposes every incremental backup as a virtual full backup. It means that not only that a restoration of a backup will not require a merging of all the changes to a previous full backup, but also that through Vembu Virtual Drive backup files get exposed as VHD, VHDX, VMDK-Flat, and RAW image files – at the same time. Those files are created (assembled from chunks) in seconds, thanks to Vembu VHFS (Vembu Hive File System). There are several techniques used to make the system very robust and efficient, such as deduplication or error correction. In fact, the system has built-in compression, encryption, and deduplication, as well as auto error correction. When you have a VM or an image backup greater than 1 TB, for example, you'd most likely use the mount option which will have your data available in seconds. Image backups when mounted have .vhd, .vhdx, .vmdk and .img file extensions. These image files can either be used for VM creation or mounted in disk management depending on your needs. The installation is very easy. I have done a short installation video which walks you through the basic steps of installation and configuration. Also, you'll see the storage pool configuration where I'm adding an additional volume to the pool to grow the storage space. The software is comprehensive enough to meet the needs of various types of clients and fits pretty much into any scenario. Enterprise Edition – This edition is for medium and enterprise business users providing basic functionalities along with extended options such as Tape Backup support, VM replication, Persistent boot, advanced GFS retention etc. Standard Edition – does not have advanced GFS, replication, automated backup verification or native tape support. Free Edition – Free edition provides users the option to utilize unlimited features up to 3 VMs and then users can backup unlimited hosts with limited features. To know more about the difference between Free, Standard, and Enterprise edition, check this page here. Vembu developed an exclusive free tool called Vembu Universal Explorer to instantly recover the individual Microsoft application items from the backed-up data. Be it physical or virtual machine data, Vembu Universal Explorer recovers application items from Microsoft Exchange, SharePoint, SQL and Active Directory without restoring the entire VM backup and disk image backup. Vembu ImageBackup –Vembu ImageBackup is a complete backup and disaster recovery solution for Windows IT environments. It provides an option to do entire system level backup or specific volume level backup. Vembu NetworkBackup – Vembu Network Backup is designed for small-medium businesses to protect business data across file servers, application servers, workstations, and other endpoints. With NetworkBackup businesses can backup all their systems to a central location which is easier to manage. 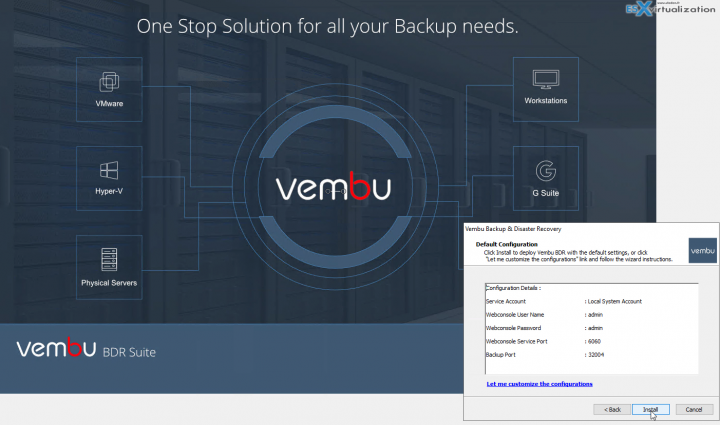 Vembu OnlineBackup – Vembu OnlineBackup provides File Server, Exchange, SQL, SharePoint & Outlook Backups directly to Vembu’s secure cloud using enterprise-grade AES 256-bit encryption with granular restores. Vembu SaaSBackup – Vembu SaaSBackup is designed to provide Backup & Recovery options for SaaS applications like Office365 & Google apps at affordable pricing. Vembu SaaSBackup allows you to backup and recovers Mails, Drives, Calendar, and Contacts of Office 365 and Google Apps at any time and anywhere. Since last time when we have reviewed the Vembu BDR suite, the product has evolved a lot. It's more polished, cleaner, and it seems also a bit faster. The UI is easy to use and the options and functions are accessible without hassle. You can have unlimited VMs backup using this tool. The replication feature allows you to replicate between remote sites seamlessly. Haven't I mentioned native tape backup support? Yes, they have it. You can have your critical VMs replicated from one ESXi host to another ESXi host for disaster recovery purposes. During a disaster or a crash of the production host, the replicated VMs can be powered on the secondary site. Yes, you can restore the backed up Hyper-V VMs to same or different Hyper-V host of your choice. You can restore the backup VMs to the different host using “Live Recovery to Hyper-V server” option.